Irene and Lawrence Cline are a team who epitomize the character and grit of the “greatest generation.” The Clines were in the spotlight at this year’s home opener for the Minnesota Twins. Lawrence, a World War II Army veteran who turned 100 last September, was invited to be the honorary flag raiser during the National Anthem. Irene, 93, was by his side as she has been for all their 70 years of marriage. 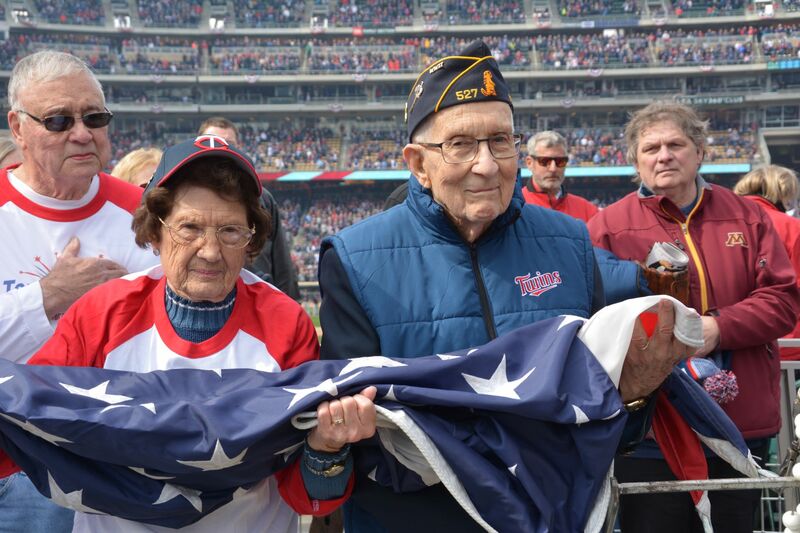 “You raised that flag faster than any other honoree I’ve seen,” commented a veteran Twins staffer after the ceremony. It was just the latest recognition for superlative service in Lawrence’s long life. During his deployment to Australia in the Army Signal Corp, he was awarded the Bronze Star for his service as an enemy code-breaker. Our Vista Prairie Community in Alexandria, MN, has been home for Lawrence and Irene for more than three years. Their life at Windmill Ponds caps Lawrence’s post-war work experience at Northern Pacific Railroad, Western Union, Soo Line Railroad and FMC. This entry was posted in Life at VPC on April 2, 2019 by Jeff Smith.